Ninety years is a long time. Going back in history, that takes us to 1926, a time when the women wore long necklaces and cloche hats. The men were stylishly dressed in double breasted suits and swagger hats—which I’m sure they tipped gallantly to the ladies. Marilyn Monroe, Tony Bennett and Andy Griffith were some of the well-known folks who made their arrival into the world 90 years ago. Winnie the Pooh was published that year. The first liquid fuel rocket was launched. NBC was founded and the World Fair was in Philadelphia that year. It was a great time in our country with big things happening, but for me, what makes 1926 so special is that my Aunt Vi was born that year. She might not have made the “most notable happenings” list for 1926, but to all of us who have been so blessed to have her in our lives, we consider her a national treasure. I’ve written about Aunt Vi before, but I've not shared some of her funny stories like the time she threw her hip out dancing to Woolly Bully! She's a spunky one, this one. She’s been faithful to her family, giving them the security of always being there for her loved ones. She’s been our confidant, our comforter and the source of so much laughter. She's been a constant source of love. I've never once left a visit with her without feeling cherished and loved. Hugs and kisses are never spared and I love you's flow freely. She's a valuable source of speaking the truth in love. While, at times, hard to hear the words are always filled to the brim with love and truth. 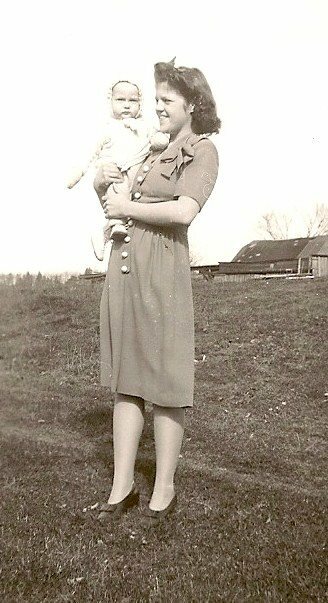 I have photos of Aunt Vi as a young woman, and she was beautiful. She’s still beautiful today, and any lines that have had the nerve to show up on her face are just gentle etchings of a life that’s been filled with love and laughter. Aunt Vi, it’s your birthday, and yet we are the ones who’ve been given the gift. I love you, and I want to be you when I grow up. Thank you for leaving a path for us to follow, for footsteps that led us in the right direction. The impact of your life will affect generations to come.